While visiting Peru in my families food journey I came across these Peruvian Alfajores. 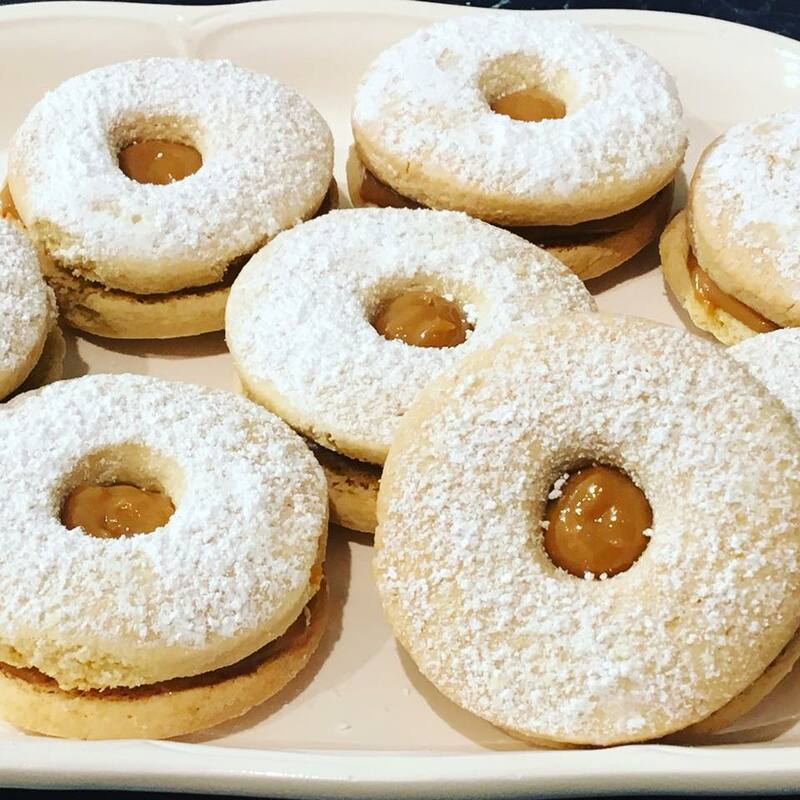 These biscuits are buttery and flaky and absolutely delicious with their dulce de leche filling. They aren't too sweet, which for me makes them the perfect sandwich cookies. Now I had to make my own dulce de leche as I could not find it in the stores, but it was really easy to make. This makes more than you need for the biscuits, but you can use it in other desserts for instance spoon into pastry cases and top with chocolate for a caramel tart, wwirl through a cheesecake or simply heat it up and pour over ice cream. Use whatever cookie cutters you have, I love them with a little 'window' cut out for the linzer effect, but if you don't have small cookie cutters, leave them whole. I have made this with my hand mixer also, so you don't need a big mixer if you don't have one. If you are short on time, here is a little short cut. Roll the dough when it is still soft between two pieces of baking paper. Refrigerate it flat on an oven tray (or freeze if you don't have much time to wait around) and cut into cookies with perfect edges. Don't forget to roll out the scraps and make more cookies, please do not discard the scraps. And if you need, simply double up the ingredients and make even more. 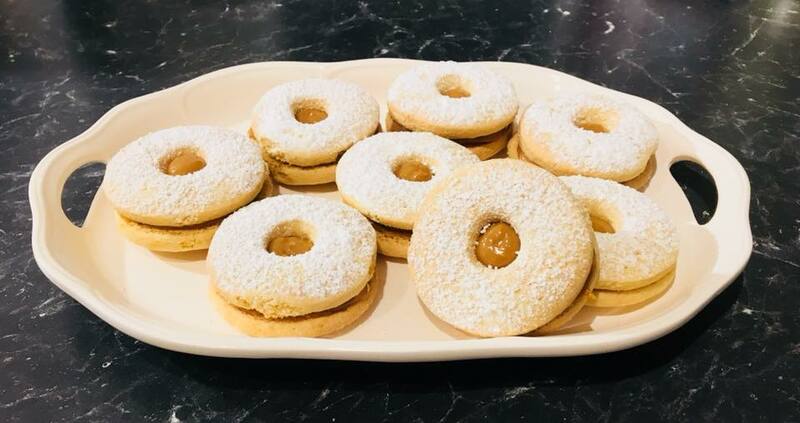 Remember to dust them with icing sugar before you assemble them, this will ensure no sugar gets on the dulce de leche in the 'window' on top. These biscuits are a great little discovery of mine, so happy we went to Peru in our little food journey from our home. In a medium bowl, whisk together cornflour, flour, baking powder, bicarb of soda, and salt. Set aside. In the bowl of a stand mixer fitted with the paddle attachment, beat together butter and sugar on medium speed until light and fluffy. Add in the egg yolks, brandy, and vanilla extract and mix until just combined. Reduce speed to low and gradually add in dry mixture. Mix just until the dough comes together and no dry pockets are visible. Turn dough onto a piece of plastic wrap, shape into a smooth disk, and wrap tightly. Refrigerate for at least an hour. When ready to bake, preheat oven to 175C/155C fan forced and line baking trays with baking paper. Unwrap dough and roll between two sheets of baking paper. Roll to 1/2cm thick and remove the top sheet of baking paper. Cut 24 x 5cm rounds from the dough, re-rolling as needed. If desired, cut a small shape out of the middle of 12 of the rounds for a linzer effect. Bake on prepared baking sheets for 12-14 minutes until the edges are golden and centres are set. Transfer to a wire rack to cool completely before assembling. ​To assemble, sprinkle cookies with a generous dusting of powdered sugar. Turn half of the cookies upside down and spread with a thick layer of dulce de leche. Place remaining cookies on top of the dulce de leche to create a sandwich.